Very Important Notice: If you need to change the battery holder, please must follow the instructions described on page 5, 6 in the manual. The Amaran Tri-8 packs unprecedented power in an incredibly tiny amount of space. It packs 888 high-CRI (95+) LED lights into an 11.5-inch panel. The high LED count means the Tri-8c is capable of outputting 23000 lux @ 0.5m, which is equivalent to a 600w. The Amaran Tri-8 has an expertly designed thermal management system. With gold lamp beads on the inside, a custom aluminium plate, and the external increase of the flow-type cooling fins, the cooling effects are maximized across the unit. The Amaran Tri-8 is virtually indestructible. With an aircraft-grade aluminium body and slim design, it allows for efficient heat airflow while maintaining a highly durable structure. To further enforce its durability, the LED bulbs are covered by an impact-proof polycarbonate casing. 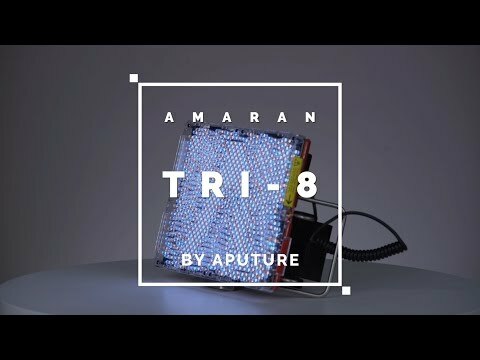 The Amaran Tri-8 ensures a portable lighting experience like no other. The stainless steel handles in the back allow you to position the light either vertically or horizontally. It can be used as a stand-in rough terrain, or you can take it on the go for fast-paced run-and-gun shoots. The Amaran Tri-8 comes with a perfectly fitted EZ Box in order to maximize your light-shaping capabilities. The EZ Box Softbox Kit prevents light spills, enhances contrast, and provides high-quality diffusion.